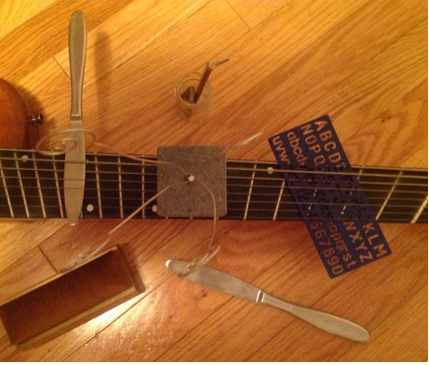 Here’s one of the preparations that I use to get unconventional sounds from the guitar. Guitar preparation allows me to create sound that doesn’t suggest the sound of the guitar. Eliminating the associations that the guitar brings to mind allows listeners to experience the sound itself. The plastic stencil muffles the sound to a certain extent when the strings are activated; the knife produces a sustained ringing sound when struck with wood or metal; the stone cube with the metal stems muffles the sound, but in a different way than the stencil. It can also be used to scrape the strings. The great thing about digital effects software (I’m using Guitar Rig 5) is that you can experiment with effects by “piling on.” This means using multiple iterations of the same effect just to see what happens. 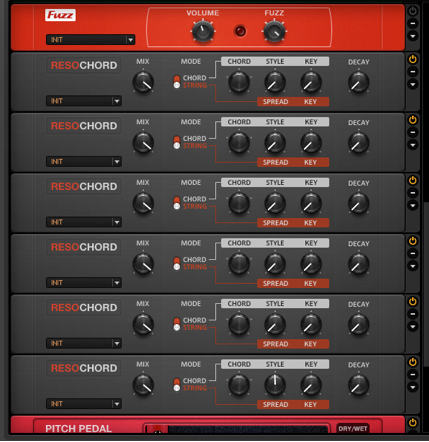 Resochord is a pitch modifier and harmonizer. It uses single pitches or chords and can pitch shift them and sustain them. Stacking a number of them like this creates a preset with a ton of harmonic possibilities. I’ve added a pitch pedal for more control, and a fuzz pedal when I want a grittier sound. This reminds me of an animal sound (a roar of some kind?) slowed down. It’s difficult to hear it as a guitar sound. A bell-like sound with something that sounds like a distorted organ. Similiar to the knife strike, but with a different attack sound. In this example, you can clearly hear the guitar. These are examples of what can be done with one preset and guitar preparations. Preset creation is not limitless, but it’s extremely extensive. Mixed with the huge variety of guitar preparations, the guitar becomes an instrument capable of tremendous sonic possibility. I described a connection in my last post between myself and the guitar. This connection doesn’t by itself differ from connection between humans and other musical instruments. All instruments are pieces of technology that communicate thoughts and feelings originating in their players’ bodies. But the electric guitar is the first musical instrument designed specifically to create sound by connecting to electronic technology outside of itself. Orchestral instruments are able use electronic technology, but doing so isn’t their normal way of operating. For the electric guitarist, electronic technology (on-board electronics, amplifiers) is integral to its origin story, and that story has evolved over decades to include effects pedals and digitization. The electric guitar doesn’t exist without this technology, a technology that represents a basic otherness, a machine-ness outside of human experience. The electric guitar blurs the boundaries between human and nonhuman, and expands the concept of what it can mean to be human. This can be said about any instrument, but the electric guitar foregrounds this idea in its extreme and varied use of technology. And this extreme is normal for the guitar. Not so for orchestral instruments. Given this normality of extremes, the electric guitar is more obviously a machine than other instruments. It becomes the standard-bearer for human-machine collaboration in a musical context. With the guitar, a machineness outside of human experience changes to become a natural part of what it means to be human. This given the the fact that it is the machine that allows us to demonstrate our humanness by allowing us the possibility of emotional and intellectual expression. If we connect to a machine (the guitar) in the way I describe here, then it makes sense that we change how we think about ourselves. Essentially, when we play the guitar, we become part machine. We forget ourselves. Sometimes we forget the guitar. Our experience is reduced to sound, and that sound is what’s left in the fusion of human and machine. Which is kind of cool. And kind of scary. And kind of what musicians have always done. Is the electric guitar posthuman? Is that a weird question? Bear with me here. I have to lay a little groundwork. Unlike transhumanism – the desire to augment humans physically and intellectually – the posthuman (related to posthumanism) is a human that has gone beyond humanism. And humanism approaches the world by emphasizing human interests over the interests of non-humans. The problem with this is that it doesn’t recognize a connection between human and non-human. We’re up here, they’re down there. And if we think that way, we close down different ways of thinking that might lead to useful insights. After all, we learn to know ourselves through daily interactions not just with other people, but with animals and with things. Things like the guitar. By trying to get better at it, we test our limits and learn about ourselves. A posthumanist attitude places humans and machines in a relationship that recognizes connection. So how does this connection change how you approach that machine we call the electric guitar? Question: How do you connect to (or communicate with) the guitar? Answer: With your thoughts and feelings communicated through your fingers. How does the guitar connect/communicate with you? Through the sound it makes; this sound is its feedback that you use to learn about yourself. You need to work on whatever doesn’t sound great. The guitar is almost like a mentor, taking input from you and giving information that enables you to get better. Try it. Play something, and see what thoughts arise in your mind. Think of those thoughts as the guitar communicating with you. Am I insane? Deluded? No, I’m a guitar player totally engaged with the instrument. There are reasons I do things like this. When I think of playing the guitar as creating a connection, I feel a sense of openness and possibility. The guitar is no longer just a thing; it actually feels like an extension of me, integrating information it receives from my body, coordinating it and organizing it into a stream of non-verbal communication. Because of this, I feel more connected to the sound I’m making. And because of that, the expression of that sound feels deeper, more meaningful. When I pick up the guitar, it becomes a collaborative venture instead of a human manipulating a tool. This change in perspective has changed the quality of my time with the guitar. It feels more positive, and the things that I make feel more like what I want to make, instead of what I think other people want me to make. I find a bit more of myself every time. There are so many scales. Many are useful. But at some point you’ll want sounds that those scales can’t give you. What do you do? Invent your own. You can do this by coming up with a simple algorithm. For scales you use an interval sequence. Most scales are made of consecutive major or minor seconds. For example, the major scale is maj2, maj2, min2, maj2, maj2, min2. The minor pentatonic uses minor 3rds and major 2nds: min3, maj2, maj2, min3, maj2. Simply make up an interval sequence. Choose a starting note and two intervals. Interval sequence: repeat maj2, min 3 until you return to the starting note. Play around with that, and see if you like it. Interval sequence: repeat min3, maj3 until you return to the starting note. These are repeating scales. Some interval sequences produce non-repeating scales. This means that they don’t repeatedly return to the starting note after a certain number of notes like the scales we’ve seen here. Try inventing scales using three intervals. Then make a few with four intervals. Or five. Whatever you want. The point is to generate melody that you can’t find in regular scales. What matters in guitar practice? What should you be working on? To answer that question, you need to decide what kind of musician you are. Singer-songwriter? Composer. Soloist? Rhythm player? Those are the main identities you get to choose from. You may be one of these one year and something else in another year. But what does it mean to be these things? How is a singer-songwriter different than a composer? What does a rhythm player need to know that a soloist doesn’t? It’s important to be clear about these things because it makes it easier to focus on the things you want to focus on. It also gives you information about other things that you may not think to work on. For instance, rhythm players focus on chords and rhythm. But knowing chords leads at some point to learning about arpeggios, which naturally leads (usually) to learning about scales.The rhythm player moves into the world of the soloist without trying to. Let’s take a closer look at the rhythm/solo relationship. …and here’s a G major triad. Using this technology requires a perceptual trick: you need to be able to play the chord and see the scale simultaneously, as well as be able to play the scale and see the chord. To get this happening, you have to practice both until they feel natural. Then put them together by playing one and then playing the other. Simple in concept, not so simple in execution. Here’s a way to work on it. Put it on a slow speed. When you get to first chord-tone, place your fingers, one by one, on the other chord-tones. Do this in time to the metronome. When the entire chord is down, go back to the first scale-tone you played (the G on the D string, 5th fret), and play the rest of the scale from there. Do this in time. Continue this exercise with each chord-tone, always returning to the G on the D string and playing through the rest of the scale. Still with a metronome on slow speed, play the scale one note per beat. When you get to first chord-tone, place your fingers on the first two chord-tones simultaneously, then on the remaining two chord-tones. Always in time. When the entire chord is down, go back to the G on the D string and play through the rest of the scale. Do this in time. Still with the metronome on slow speed, play the scale one note per beat. When you get to the first chord-tone, play the entire chord, then continue with the scale. Go back to the G on the D string and play through the rest of the scale. Do this in time. As these exercises make obvious, the chord-tones are part of the scale. A major implication is that you can choose any three or four notes from the scale, play them together and call them a chord. Don’t worry about giving that chord a name; just write it down so you don’t forget it. Then invent another one. Play those two invented chords as a progression. Play one chord for two beats, then the scale for two beats. Then play the second chord for two beats, then the scale for two beats. Continue going back and forth between chords and scale in this way. Once you’re used this structure, it will start to be easy to alter it (i.e. chord for one beat, scale for three beats, chord for three beats, scale for one beat, etc). Eventually, moving between scale and chord becomes natural. 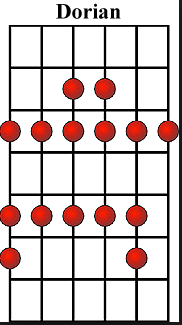 Here are the arpeggios in the B dorian mode starting on the 6th string, 7th fret. This is a bit of a finger exercise. Take it slow. And here are the A ionian arpeggios from the last post. First, make sure that you’re comfortable playing both. Once your fingers are comfortable playing the arpeggios in each mode, moving between them is a lot easier. The method for doing this is pretty straight ahead. Just play the first arpeggio of the A Ionian mode, the one that starts on the 6th string, 5th fret. Then move to the first arpeggio of the dorian mode. That takes you from the A major arpeggio to the B minor arpeggio. Here’s what that looks like. I’ve added a continuation of the dorian mode. The next thing to do is work on moving from A ionian to B dorian, starting on every arpeggio in A ionian. You can also start from any arpeggio in B dorian, and move to A ionian.